The Saniflo Sanicompact is a self-contained system that combines a vitreous china toilet with a powerful macerating pump into one compact unit. Capable of pumping vertically up to 9 feet below a sewer line and horizontally up to 100 feet away from a soil stack, it can easily handle the effluent from a toilet and sink. The unit is specially designed to fit in areas where there is limited space, uses a minimum amount of water, and is ideal for use by people with physical limitations. The Sanicompact doesn't need a gravity flow tank for the flushing action. The macerator pump cycles automatically when the button is pushed at the top of the bowl. The button activates a timer and a solenoid valve to fill and wash the inside of the bowl. Water and waste is sucked inside, macerated into a slurry and pumped away. The motor stops after a 10-15 operating cycle, and the timer programs the refill of the bowl. The dual flush system uses only 1.28 gpf (4.8 lpf) and 1 gpf (3.8 lpf) to save on water usage. 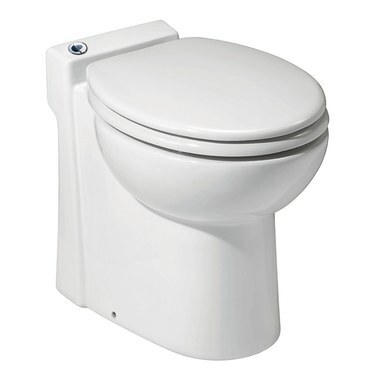 The Sanicompact toilet does not need to be vented and connected to a vent stack. It is recommended that the macerator/pump be connected to a Ground Fault Interrupter (GFI) circuit. The Sanicompact is certified to American and Canadian Standards. Macerating standard; US: CSA Certified - ASME A112.3.4, CA: Macerating Standard CSA B45.9. Includes the toilet seat. I keep reading about up flushing. Can this be used in an upstairs room?